The Predictable 10 inch tablet bundle gives you access to the device with a large screen, with TBoxApp Predictable installed and ready to use. 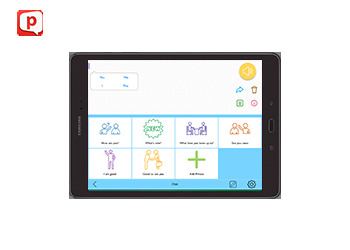 The Galaxy Tab is the device of choice for people who need a larger screen because of visual impairment, motor skill impairment affecting accuracy, and for those wanting to use the Galaxy Tab as a recreational device as well as a communication aid. Also featured are the app guides and manuals, and a selection of suitable accessories to get you started. Includes full customer service and support, and is suitable for a range of users.